These are just the instruction sheets that came with the trick for those who may have lost the instructions or curious how the trick is done. These instructions DO NOT TELL YOU HOW TO MAKE UP THE TRICK, just the secret behind the trick. EFFECT: A board is shown and two paint cans; one can containing Polka-dot Paint and the other Striped Paint. Magician remarks that he often wondered how polka dots were made. He found out they use Polka-dot paint. He dips a brush in the proper can and proceeds to paint the board with polka dots! Turning the board over he says he has also found some striped paint. There are vertical strips and horizontal stripes, but since he wants to please everyone, he will paint diagonal stripes. 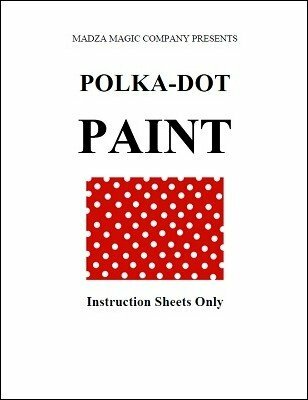 Dipping the brush in the can of striped paint, he paints down the board, but polka dots appear within the stripes. Magician says, "I guess I didn't clean the brush properly." so he wipes the brush off on the edge of the can and tries again. This time he is successful and paints the entire board. 1st edition 1949, 2 pages.